If sun, surf and sand are your idea of fun, there is plenty to experience on the beaches of Dubai. The sea is crystal-clear and warm; the sand is soft, and each beachside area has its own distinct personality. For visitors, there is a world of discoveries in terms of things to do; whether it’s a board-riding adventure, a sandcastle-building playdate on the shore, or just some gentle waters to splash around in on a lazy afternoon. The newest beachfront cove on Dubai's extensive coastline is La Mer. From water slides to water sports, playgrounds, beach strolls, shopping or just relaxing on the beach, there’s something for the whole family at La Mer. Dubai takes its water quality incredibly seriously, priding itself on its crystal-clear sea. It has been a proud participant in the international Blue Flag programme since 2010. The beaches along Dubai’s coastline all fly the flags, which are an international environmental standard, symbolising that a beach has clean, safe water to swim in. "Water quality is vital," explained Natalie Banks, Managing Director of Azraq, a marine conservation group. "We really can't have a healthy ocean without good quality water, so they both go hand in hand. We get to see some beautiful rays here in Dubai, we also get to see turtles. Another good destination is Black Palace Beach, which is also known as Secret Beach. It's situated between the Burj Al Arab and Palm Jumeirah and considered something of a hidden gem for those wanting to avoid the crowds. Black Palace Beach is another picture-perfect location and a great place to relax with children. Watersports enthusiasts particularly like Umm Suqeim beach, which also goes by the name of Sunset Beach. This is liked by paddleboard enthusiasts and, if there are waves, surfboards are available to rent. Daniel Van Dooren, Co-Founder of Surf House Dubai says that most people do not expect Dubai to have waves, "They expect desert and flat coastlines so people are very surprised when they do come over here and discover that there are definitely surfable waves and some beautiful oceans for stand-up paddle boarding. The Dubai Pirates Surf Rescue Team on Kite Beach are an organisation dedicated to teaching children how to be safe in the sea. They cover teamwork, cooperation and respect for the water. Candy Fanucci, Founder of the Pirates Surf Rescue Team said: “I think the number one factor is safety. You need your kids to feel safe in the water and number two to build confidence and water opens up so many avenues, especially for swimming, for leisure, for sporting activities. "There is no greater gift that you can give your child than making them feel confident and happy in the water. We have kids travelling around the world, maybe passing through Dubai, we welcome them with open arms. We're not only a club, we're a family towards kids. We create a safe community where they can come and enjoy the beautiful beaches of Dubai and connect with the children that are here." Dubai Pirates cater for everyone from eight to 18. They can practice beach runs, ocean swimming, paddling, kayaking, surf rescues and much more. 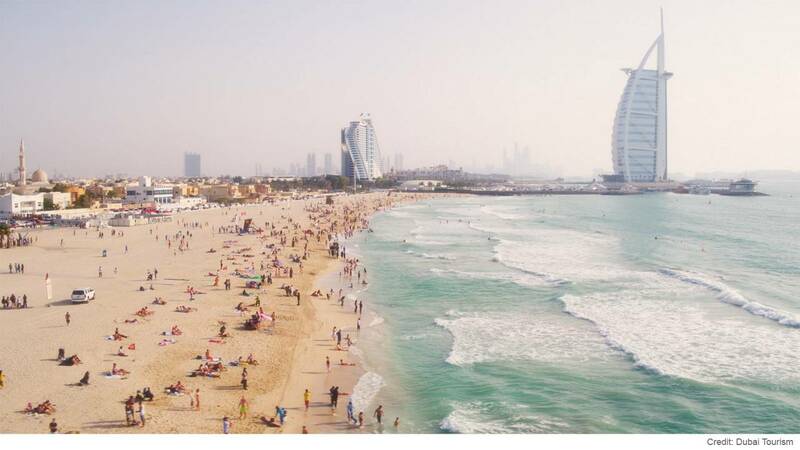 Dubai’s balmy climate means it is beach-going weather most days of the year. Average monthly temperatures range from the mid-20s in January to the mid-40s in August. Even in the warmest months, a refreshing morning dip in the sea can help start any day right.